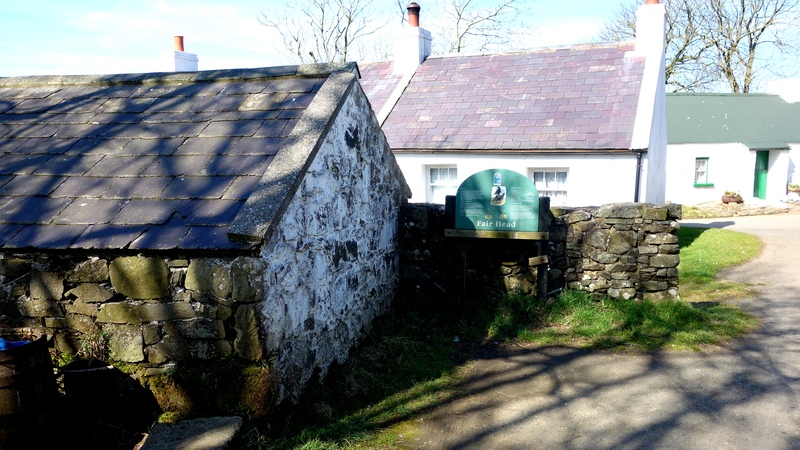 So when you find the car park among the (seemingly empty) white cottages, drive in and park up and youll see this sign hilariously hidden behind a wall lol. 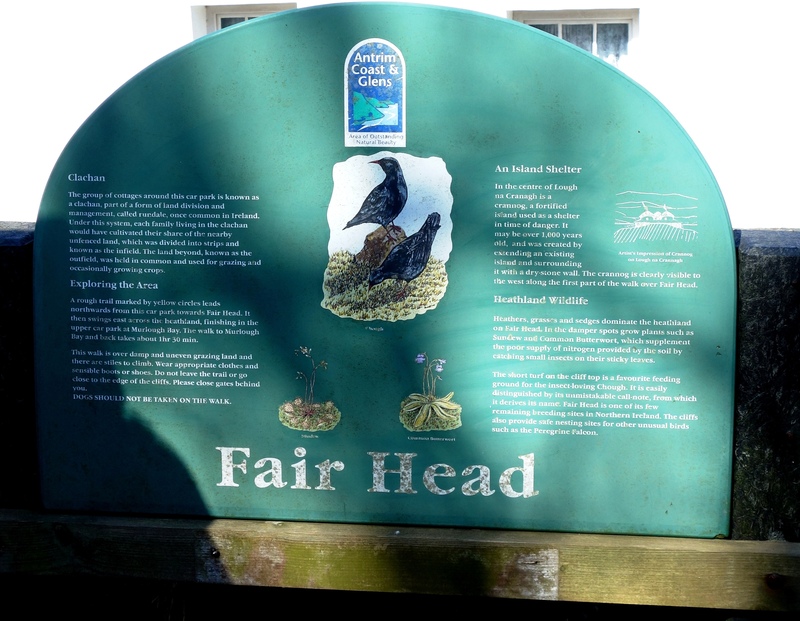 The sign says there are “yellow circles” marking the route to Fair Head but good luck with that as we found only one which had been bleached white. Maybe they repaint them now and again but we just wandered about like lost sheep (across marshy bog land) and only found the edge of the cliff by trial and error. 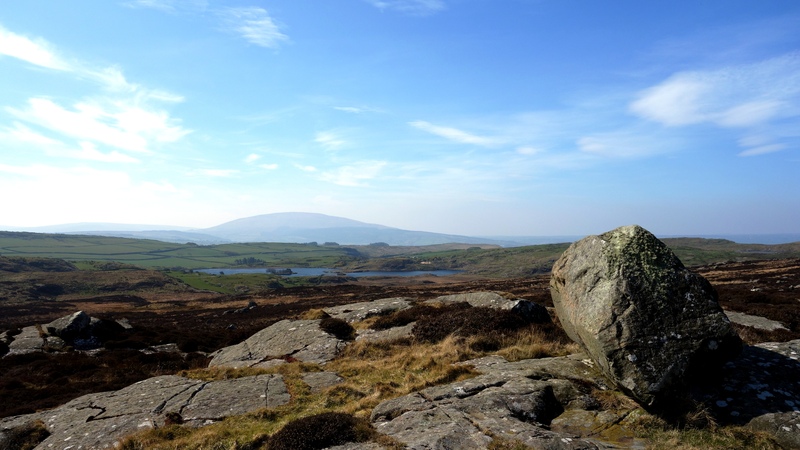 The area up to Fair Head was pretty expansive. The car park from this point is further away than that lake you see in the distance. Our first view from the edge. It was hard to keep the horizon straight for the pictures as we couldn’t see it, it was quite a hazy morning. 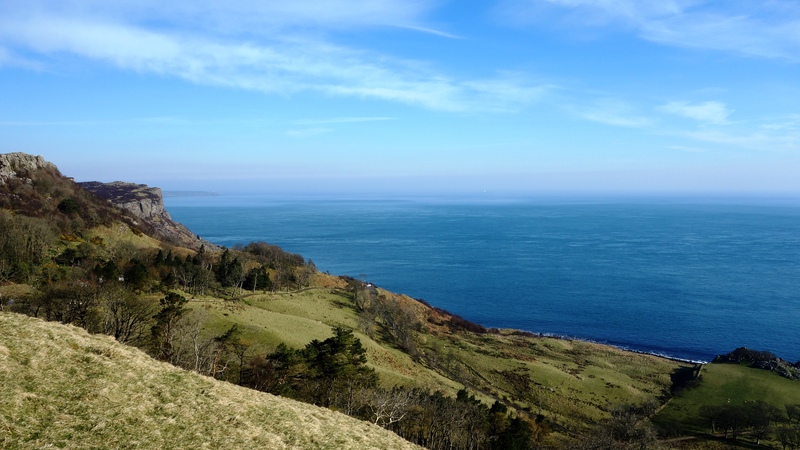 The second bay in the distance is Murlough Bay where the big white house is I posted earlier. The sign says you can walk from here and it takes 90mins, but I really imagine its much more. Its always hard to convey exactly how high up a place is in photographs, no picture can really do it justice. The highest point here is 196mtrs above the sea, and quite a bit of it is near vertical. If you have a fear of heights beware! 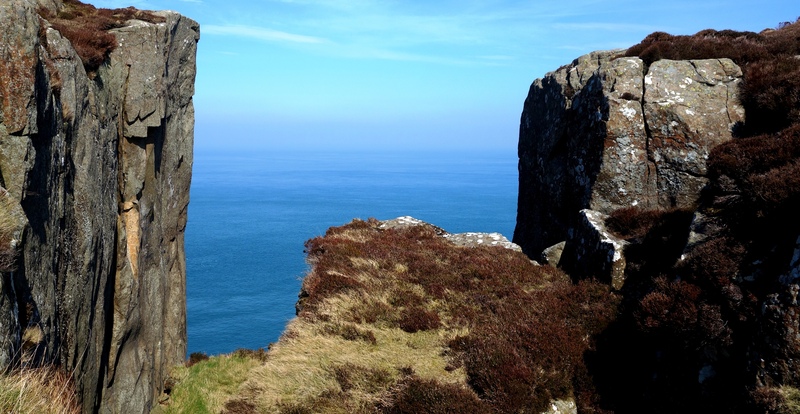 In the distance (in the first picture) you can see Rathlin Island. 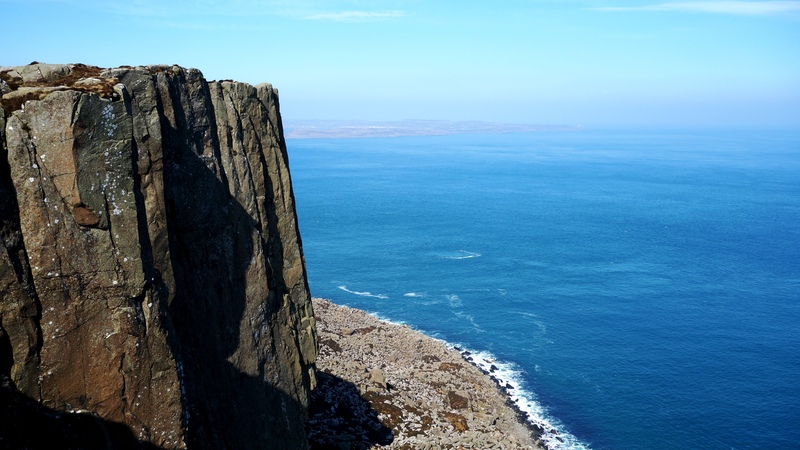 We saw this climber about to descend the huge wall of rock at Fair Head. This picture will give you some idea of the size of the rock face. 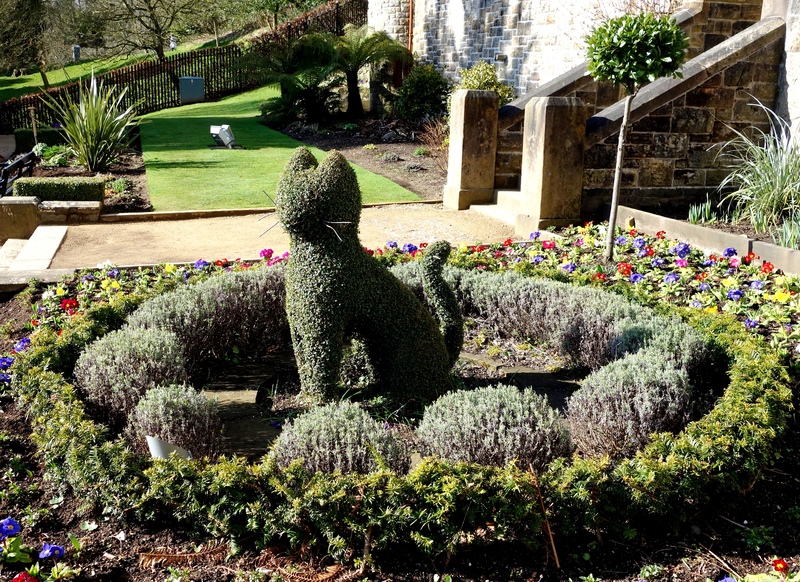 In the second picture is a little dog who followed us up from just after the car park. 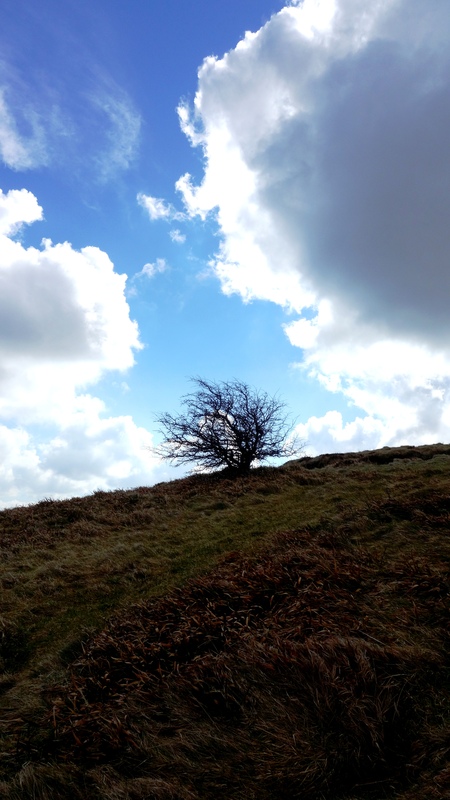 She seemed to be alone as no one else was around, and the climber we came upon didn’t know who she belonged to either. When we were leaving she simply disappeared again. 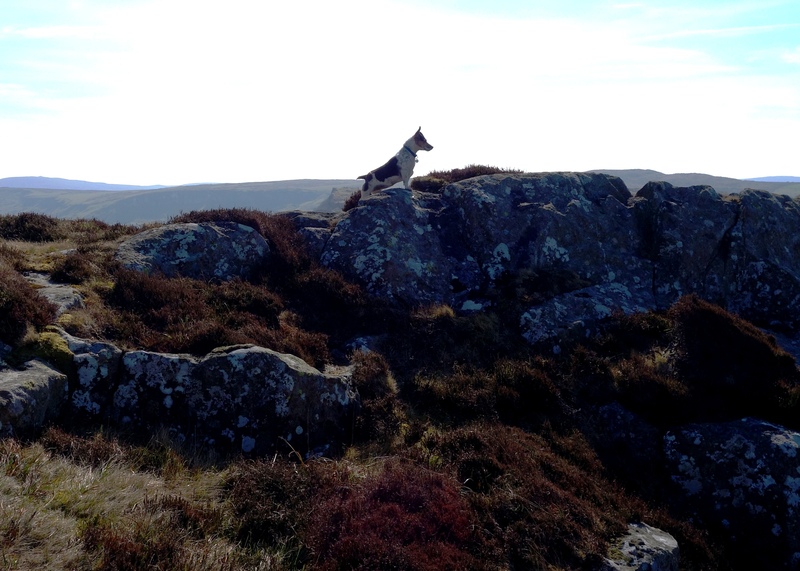 Maybe it was some doggy spirit of the Fair Head moors haha woof! 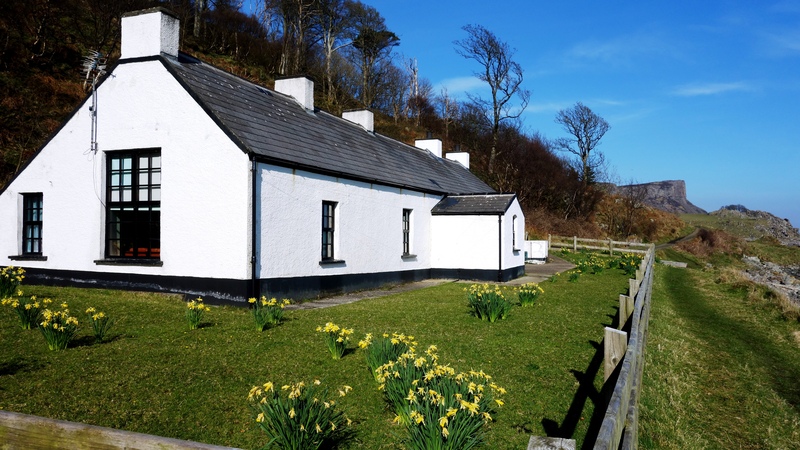 Its not often, though its happened for a few years now, where we actually get great weather in April in NI. And given this was Easter week, all the schools were closed and many people had taken to their cars to head to the seaside. 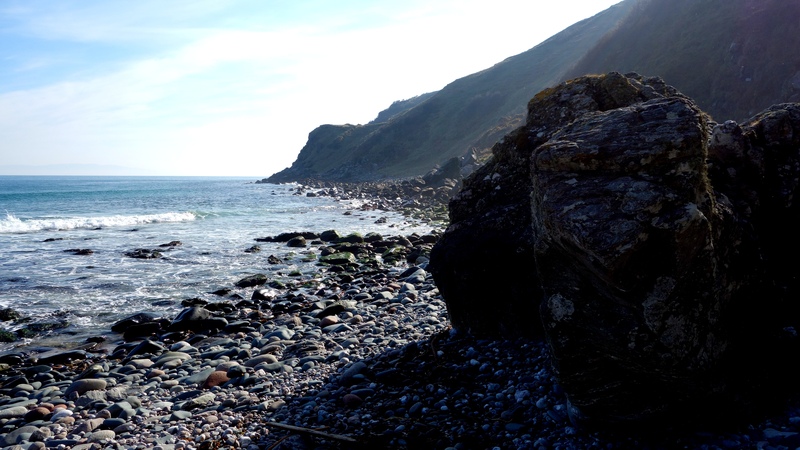 With that in mind, we set out pretty early from home and arrived at Murlough Bay around 9am. 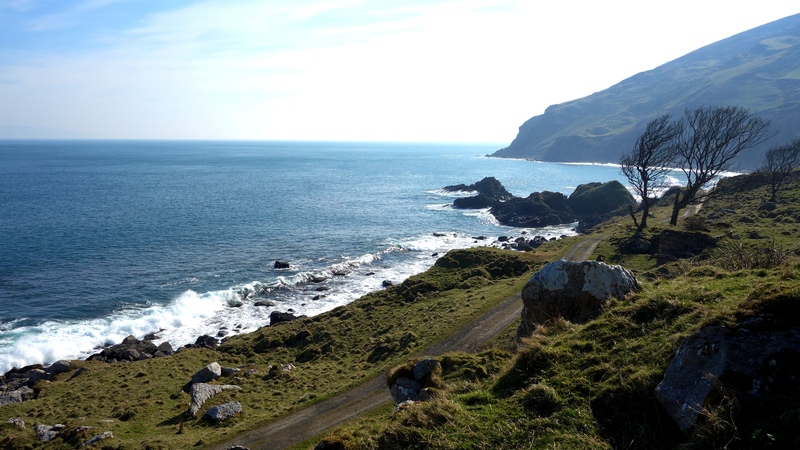 At this point I need to say that there are essentially two “Murlough Bay” in Northern Ireland, one in Co.Down and this one in Co.Antrim. Make sure you locate the correct one haha. 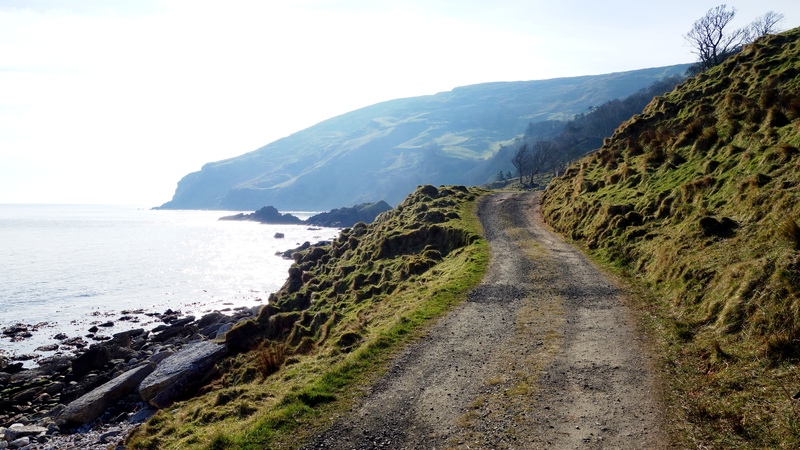 The bay in Country Antrim is likely a little harder to find but in many ways that makes it all the more peaceful when you finally get there. There are 3 car parks at the site and my view is to totally ignore the first one (you come to) unless you want to stop there first and take a photo of the view below before you descend (the first picture here shows that view). Move on then to at least the second car park along the (pretty narrow) road and park up, or take the route of the brave, past the subsidence warning sign, to the last car park no.3 – which is the most perfect stop but many may not want to risk it. From here you will have no climbing to do back to your car however. 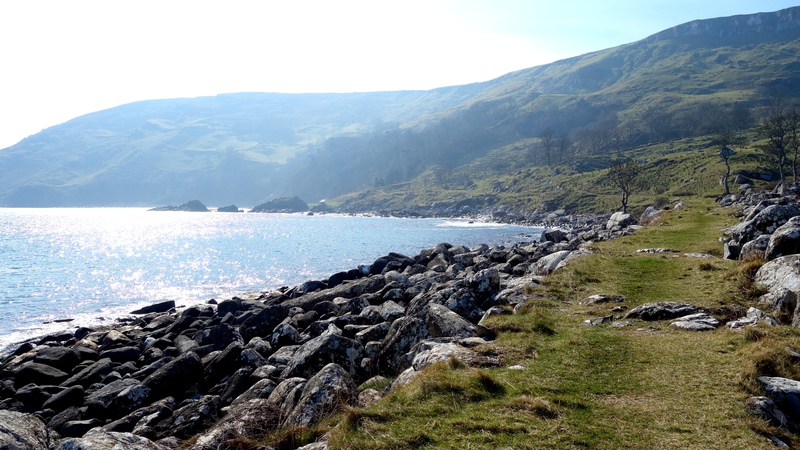 Murlough Bay sits between Fair Head (posting that next) and Torr Head, near Ballycastle. This is the view if you stop and walk a little down hill from the first car park. If you look towards the centre of the picture you should be able to see a white van, that is in no.2 car park. From there you can see the (tiny) road cutting diagonally away heading for the last car park. Be advised that all 3 are quite small so you should arrive early or you might have some reversing to do. You can see a small part of Rathlin Island in the distance to the left of the picture. Theres a road that extends beyond the third car park but dont drive any further. It leads to a private cottage so just walk along here instead. 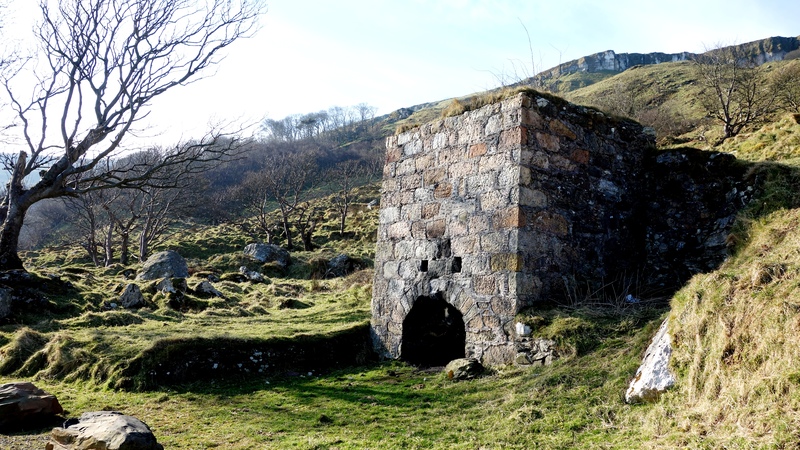 On your way you will pass an old lime kiln still in good condition. They put alternate layers of limestone (from the hills above) and coal in it to burn and produce quicklime used in cement etc (the quicklime was raked out of the arch at the bottom after burning). 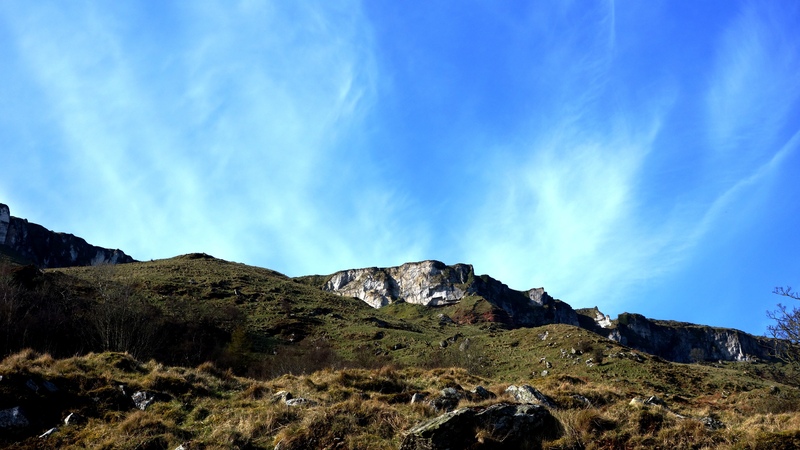 Look up here, about 200ft high above you are the limestone cliffs used in the kiln, hard to believe these were once under the sea. 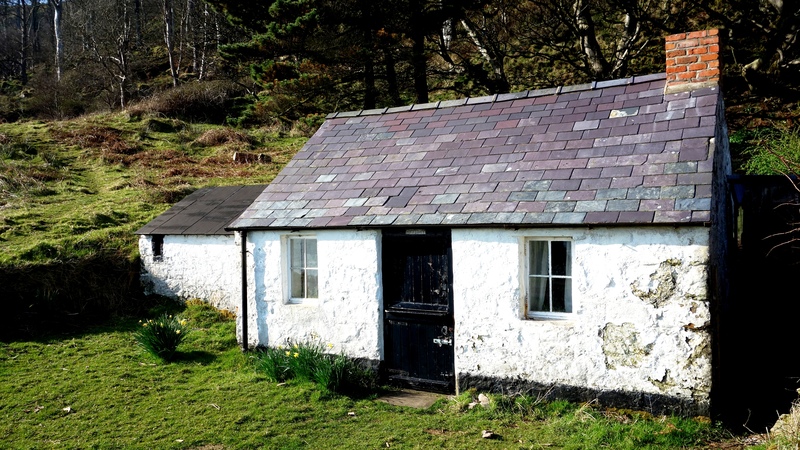 The little cottage is called a “Bothy” an old labourers cottage used either for kiln workers or fishermen I suspect. Sometimes these would be left open as a refuge, but this one is locked. Over to your left are the remnants of some long lost building foundations, and part of a wall. Maybe a fishery or some ancient cottage. After that you will come to this private house. I reckon it must get a lot of photographs taken of it, as it adds a great focal point to the entire area. 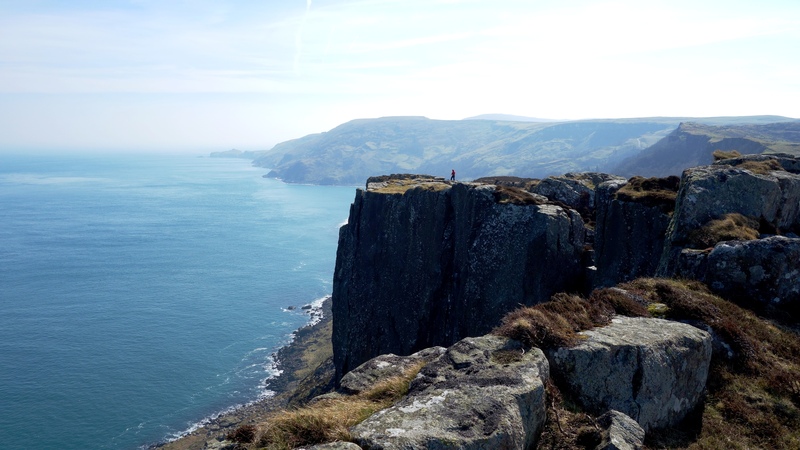 The bay and Torr Head lie before you. A place of natural beauty. 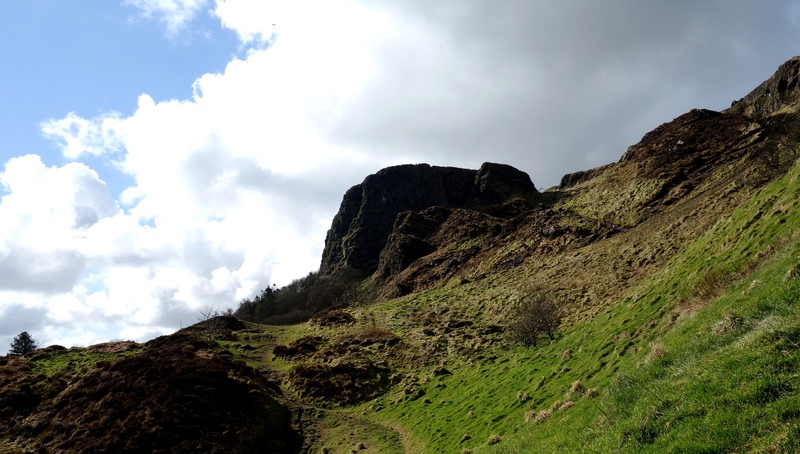 Fair Head pointing towards the sky in the first picture. Torr Head in the second. You might just be able to see the shadow of Scotland on the horizon here. 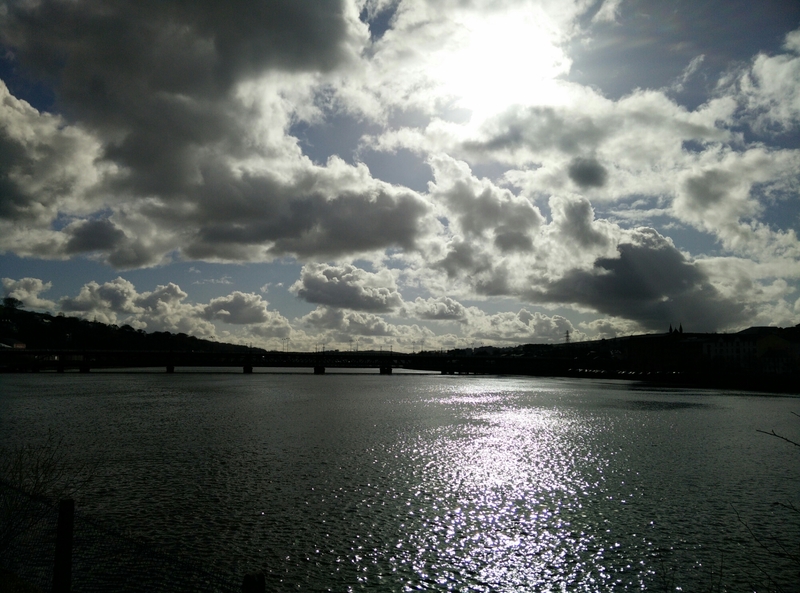 View from Londonderry Train Station (right now) towards Craigavon Bridge. Just a quick phone pic of Derrys cloud dotted sky in front of the train station right now. 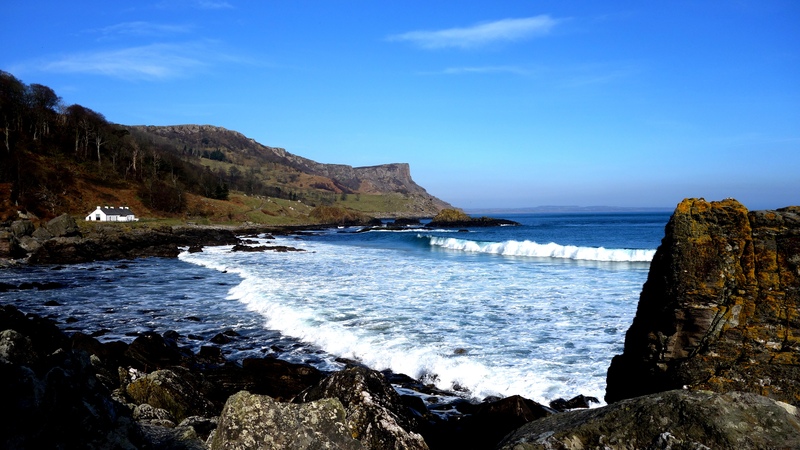 Will be posting some nice pix of Murlough Bay (Co.Antrim) tomorrow taken a few days ago when the weather was beautiful. 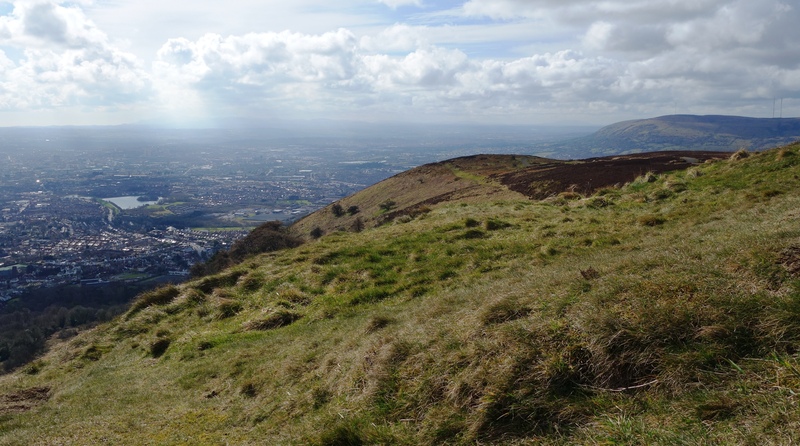 Cave Hill, sometimes spelt as Cavehill, is a basaltic hill overlooking the city of Belfast. 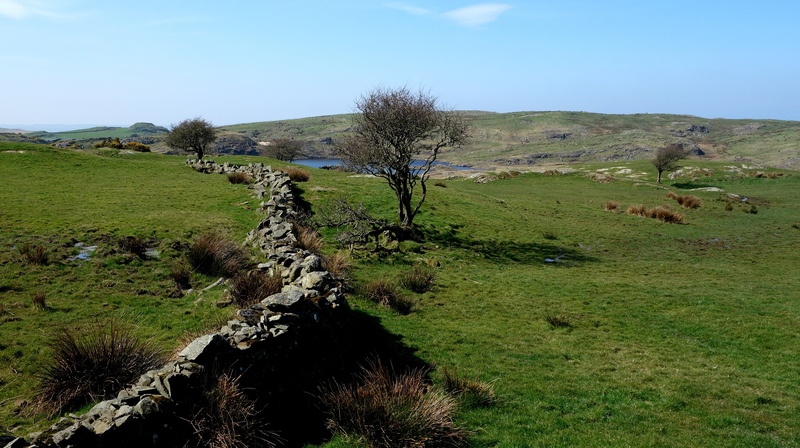 It forms part of the southeastern border of the Antrim Plateau. 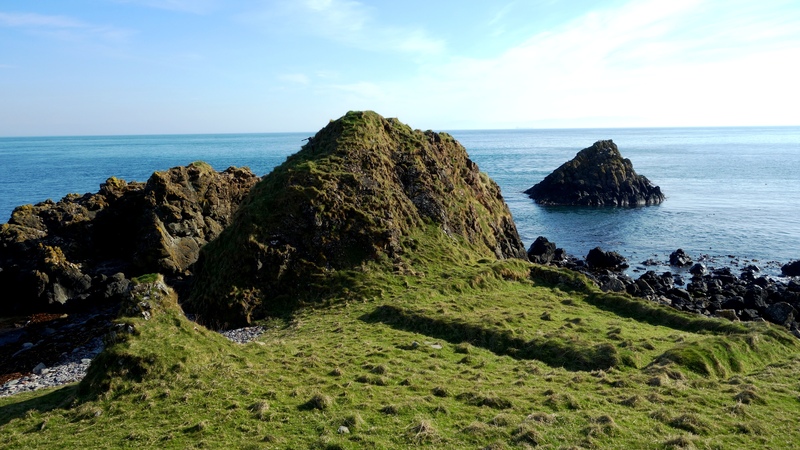 Historically it was known as Ben Madigan, which is derived from the Irish Beann Mhadagáin, meaning “Madagán’s peak”—so named after a king of Ulster called Madagán who died in 856AD. 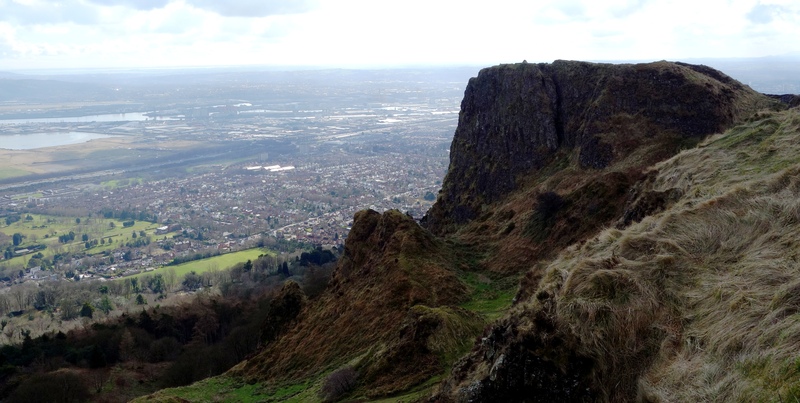 All of Belfast can be seen from its peak and Cave Hill is thought to be the inspiration for Jonathan Swift’s Gulliver’s Travels as Swift imagined that Cave Hill resembled the shape of a sleeping giant safeguarding the city. 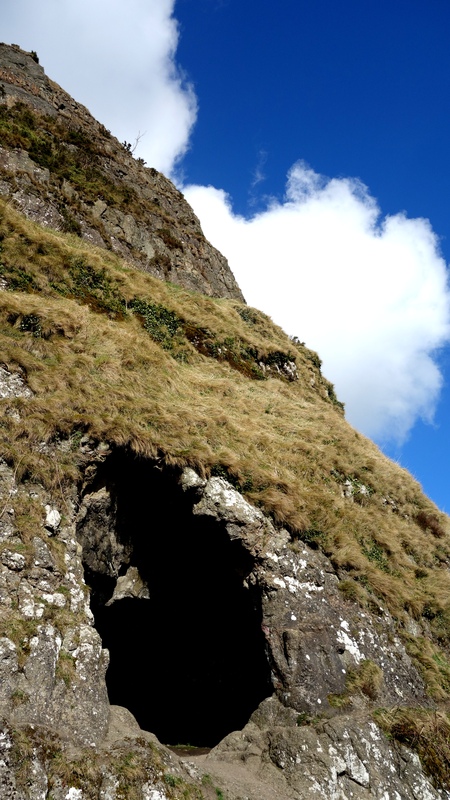 Cave Hill rises to almost 370 metres (1200 ft) above sea level. 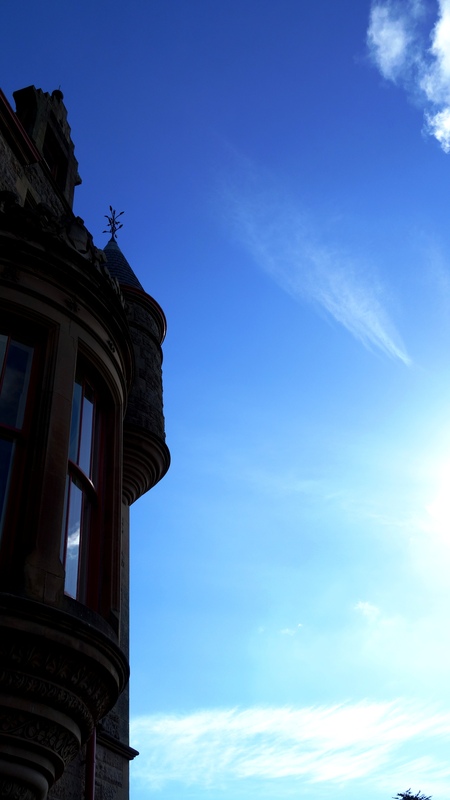 Most of its lower east side lies on the Belfast Castle estate. 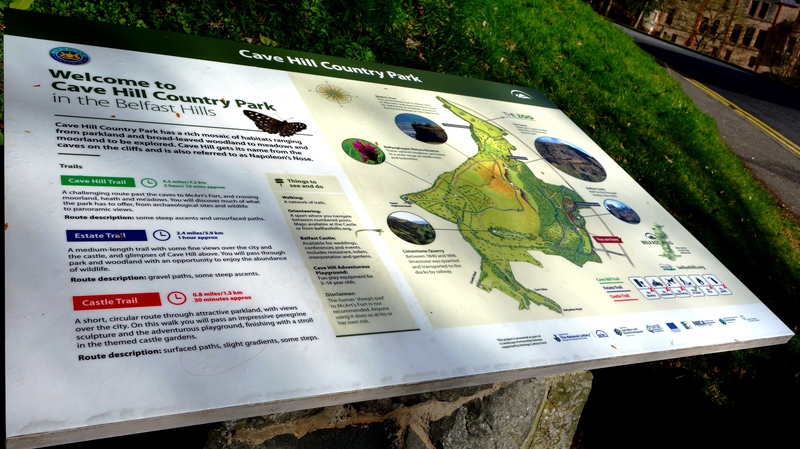 The slopes of Cave Hill were originally used as farmland but, from the 1880s, a major planting exercise was undertaken, producing the now familiar deciduous and coniferous woodland landscape. 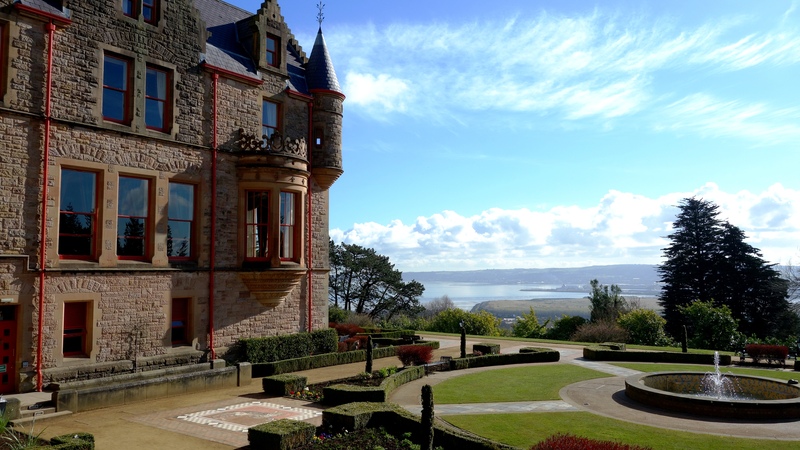 Belfast Castle estate was given to the City of Belfast by The 9th Earl of Shaftesbury in 1934. There are three large caves. The lowest is 21 feet long, 18 feet wide and varies from 7 to 10 feet in height. Above this is another cave; 10 feet long, 7 feet wide and 6 feet in height. Above this is the third major cave, said to be divided into 2 unequal parts, each of which is more extensive than the larger of the other caves, but the ascent is notoriously dangerous and thus few venture up to it. The caves are entirely man-made, and it is thought that they were originally excavated for iron-mining. This is the easiest cave to access and the most easily visible from below. 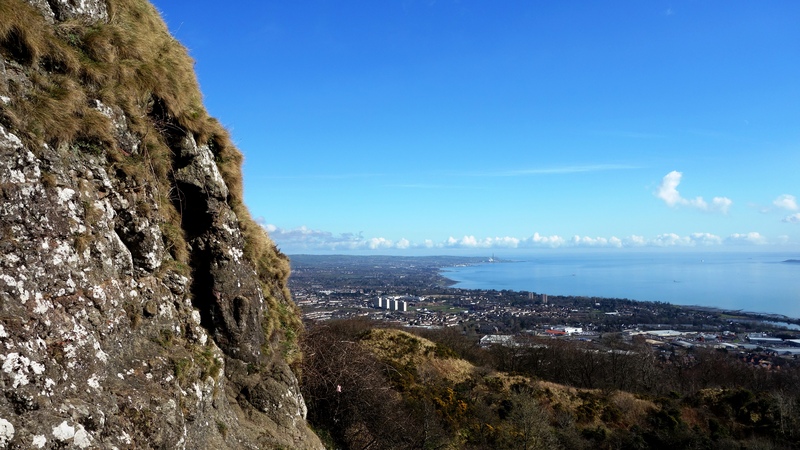 The climb up to this point (from the grounds of Belfast Castle) is probably the most tiresome part of the Cave Hill climb but its not beyond most peoples ability. Bring some water if you’re going up in the warmer months (and a coat in the colder ones!). 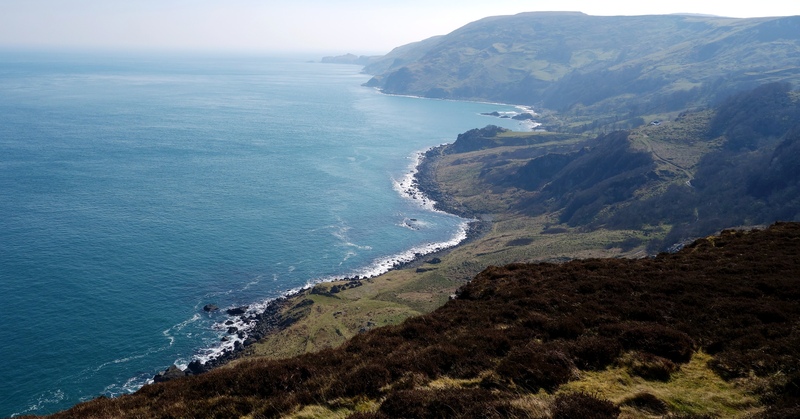 The views from the top are pretty amazing with one side of the water being County Antrim, and the other County Down. You can see all of Belfast Lough and the ship here is the Stenaline service heading for Scotland (the vague shadow on the horizon). The chimney to the distant left of the picture is Kilroot power station which provides electricity for one third of Northern Ireland, and in the bottom foreground of the picture you can see Belfast Zoo (the brown bear cage I think). McArt’s Fort on the summit of the hill, is an example of an old ráth or ring fort. It is protected on one side by a precipice and on the others by a single ditch, 10 feet in depth and 25 feet in width. The enclosed area is nearly level. 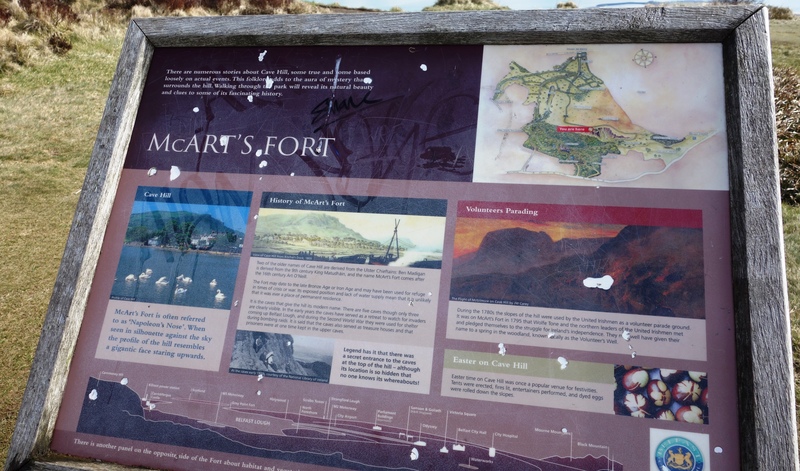 The flat top of the fort is 150 feet from north to south, and 180 feet from east to west. It is believed that the fort’s inhabitants used the caves to store food for the winter and may have served as a refuge during times of attack. 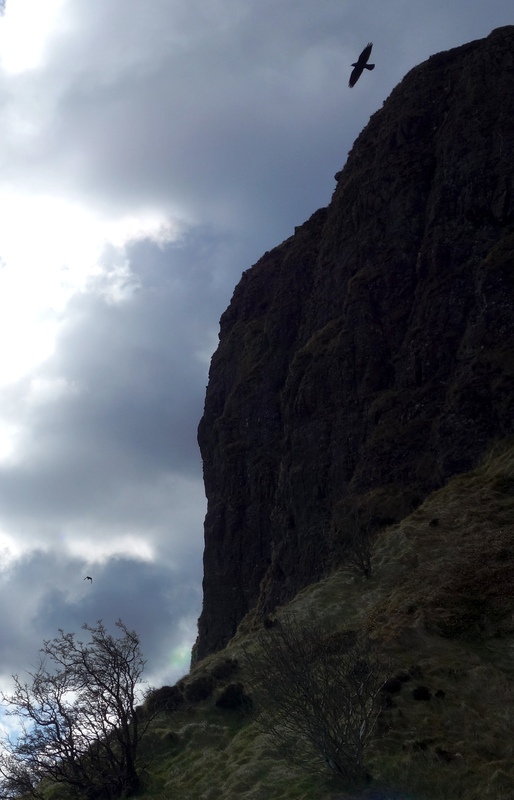 If you look towards the bottom of the last picture you can see a cave there. The residential neighbourhood at the foot of Cave Hill’s entrance is derivatively known as Ben Madigan, with street names to match, and is a wealthy semi-outer city, semi-suburban area. The name ‘Ben Madigan’ can also be found attached to buildings, schools etc. close to the area, e.g. the Belfast Royal Academy has the Ben Madigan Preparatory School on the Antrim Road. 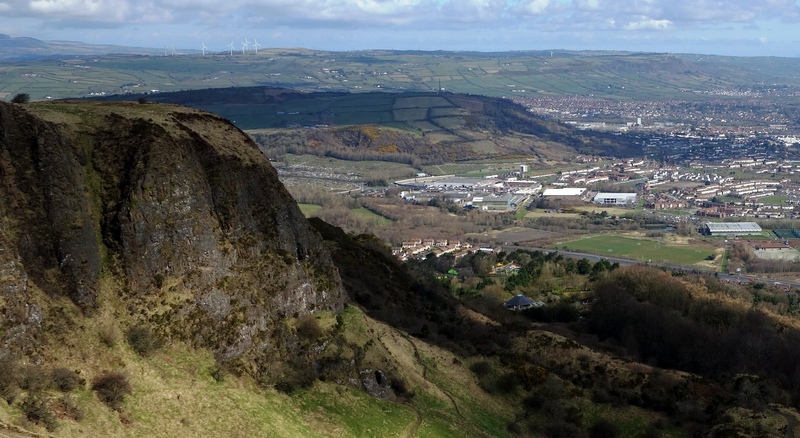 During World War II, a bomb dropped during a German bombing raid on Belfast exploded, causing a large crater near the grounds of Belfast Castle. 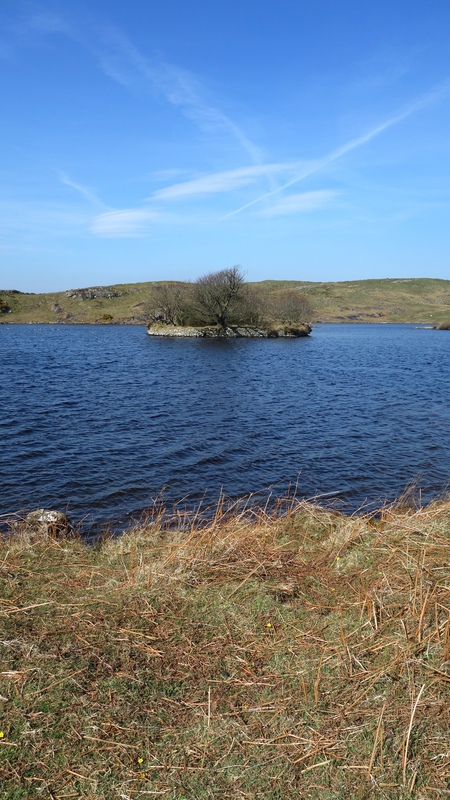 It is understood that RAF Bomber Command was situated on Cave Hill in the early years of WWII before relocating to Castle Archdale in County Fermanagh. On 1 June 1944, an American Air Force B-17 bomber crashed into Cave Hill during heavy fog, killing all ten crew instantly. The incident inspired Richard Attenborough’s film, “Closing the Ring” and some scenes of the film were shot on Cave Hill. 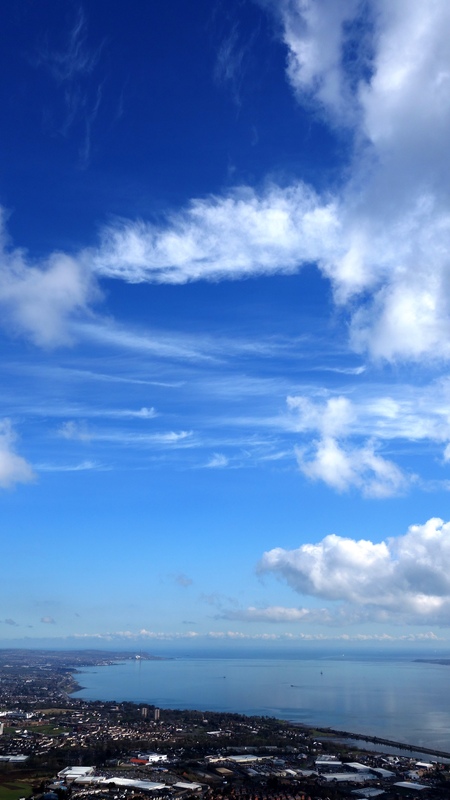 One for you cloud spotters, and the rolling Belfast hill walkers. 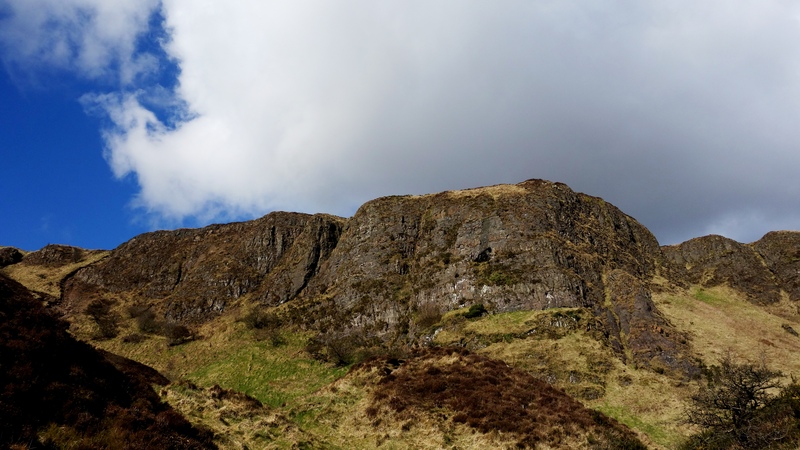 I initially intended to have a joint post between Belfast Castle & Cave Hill (given they’re effectively joined at the hip) but we took just too many great photos that day so I’m putting them up on separate posts instead (Cave hill next). 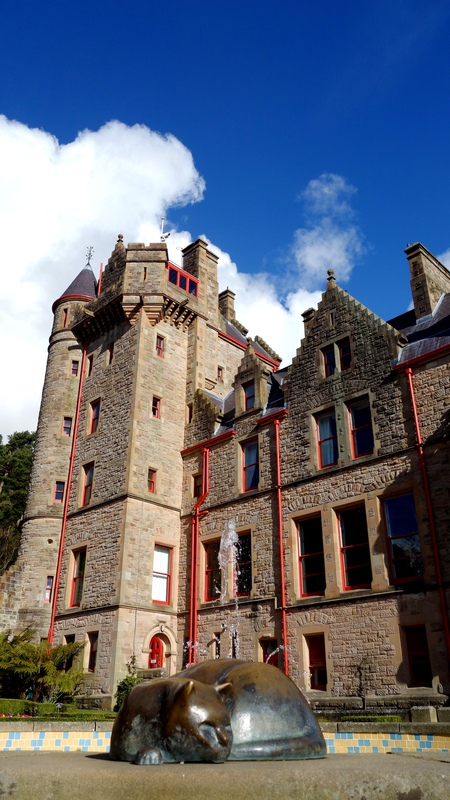 Belfast Castle is set 400 feet above sea level on the slopes of Cave Hill overlooking the city of Belfast, in many ways its more of a grand house than an actual castle in my opinion. 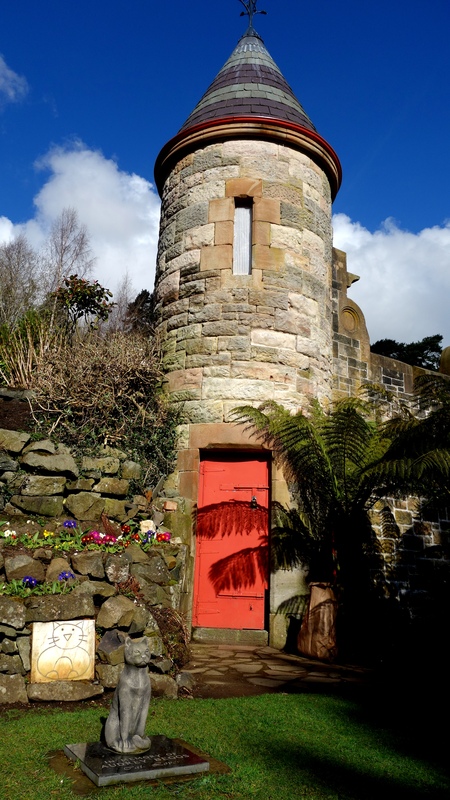 It was built in a Scottish baronial style with the main part of the building set over two floors and having semi circular round towers at the corners. 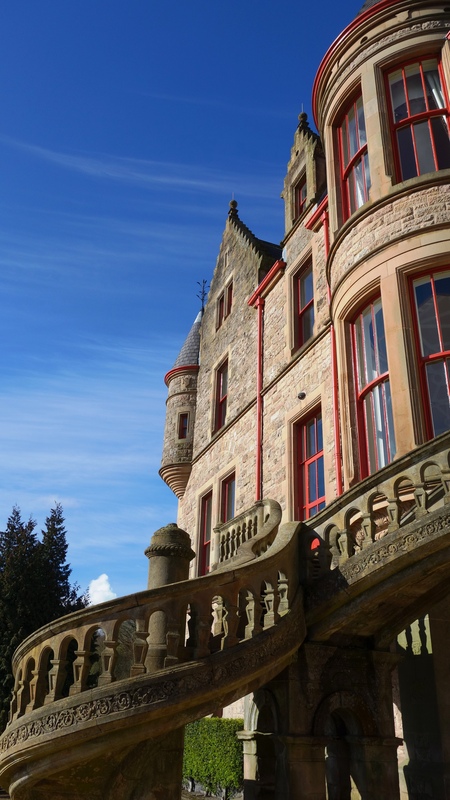 Outside the castle has a sweeping stone staircase overlooking the formal gardens and park. 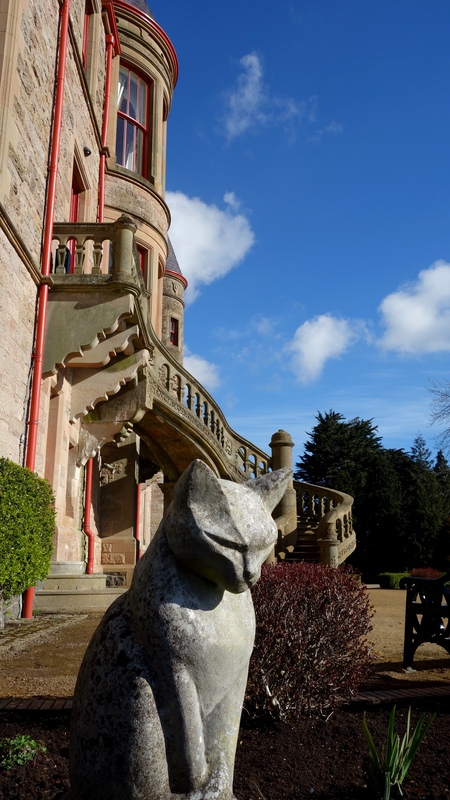 Belfast Castle is open to the public daily with a visitor centre, antiques shop and restaurant, for families the castle even has its own adventure playground. The castle can host both wedding receptions and civil ceremonies in one of its private rooms (we saw a young couple getting their instructions on the day we were there). 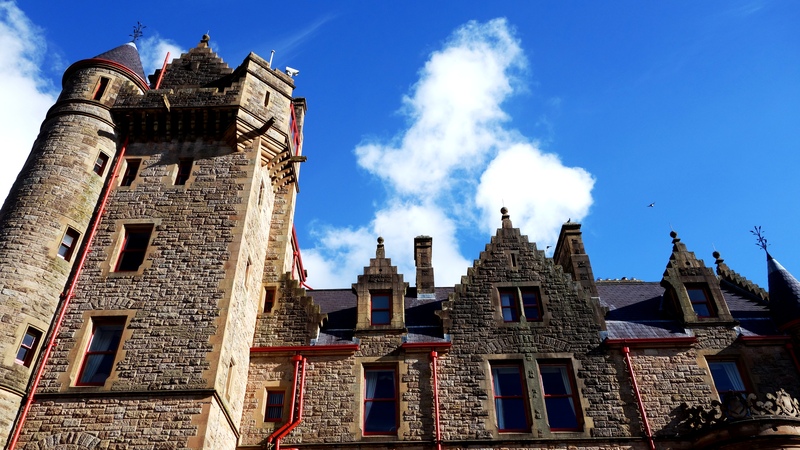 The original Belfast Castle was built in the city centre by the Normans in the 12th century and was home to the Baron of Belfast, Sir Arthur Chichester, who later became the Marquess of Donegal. 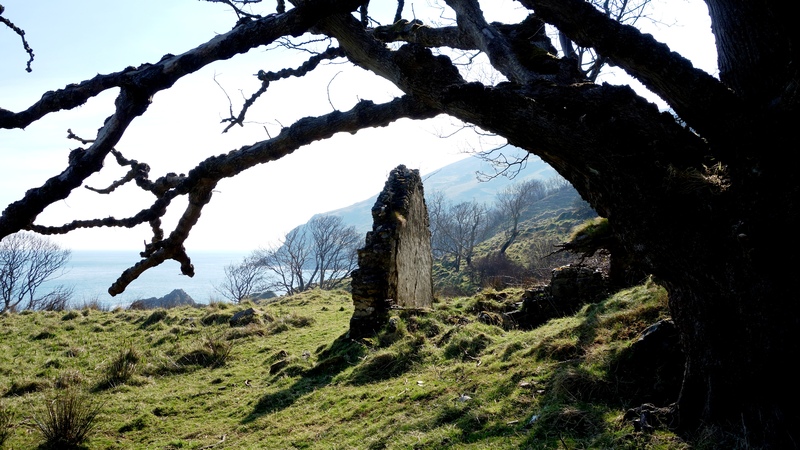 The castle was burned down in 1708 and rather than rebuild it on the same site it was decided to build a new castle within the deer park on Cave Hill many years later. The new castle was almost completed in 1870 but due to the rising costs of the building and the loss of the family fortune it was unfinished. It was the Marquess’ son in law, Lord Ashley 8th Earl of Shaftsbury, who paid for the castle to be completed and inherited it in 1884. 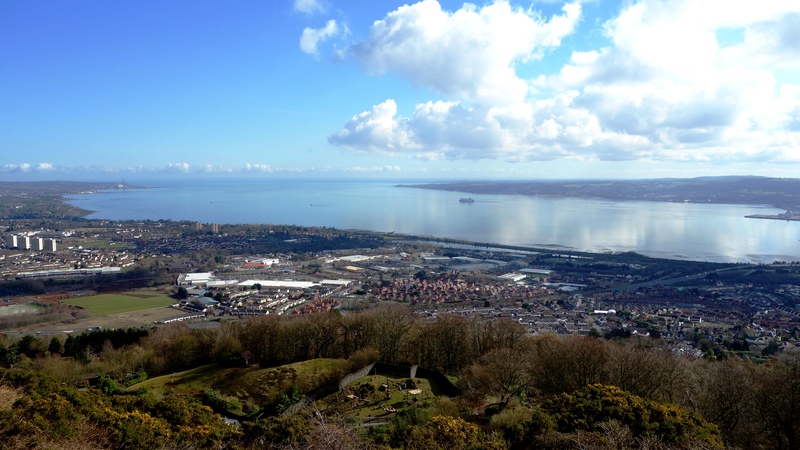 There are amazing views from the front of the castle across the entirety of Belfast Lough and the city. And on a clear day, Scotland can clearly be seen to the east. 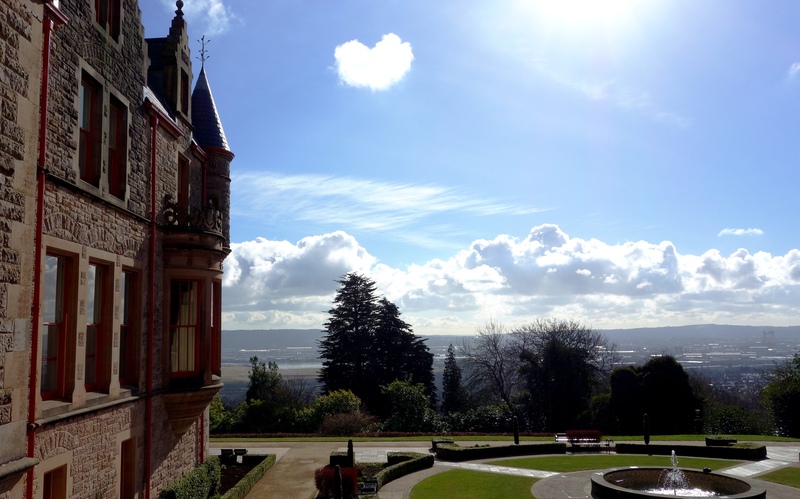 A magnificent March morning at Belfast Castle. You can see the lough in the distance. 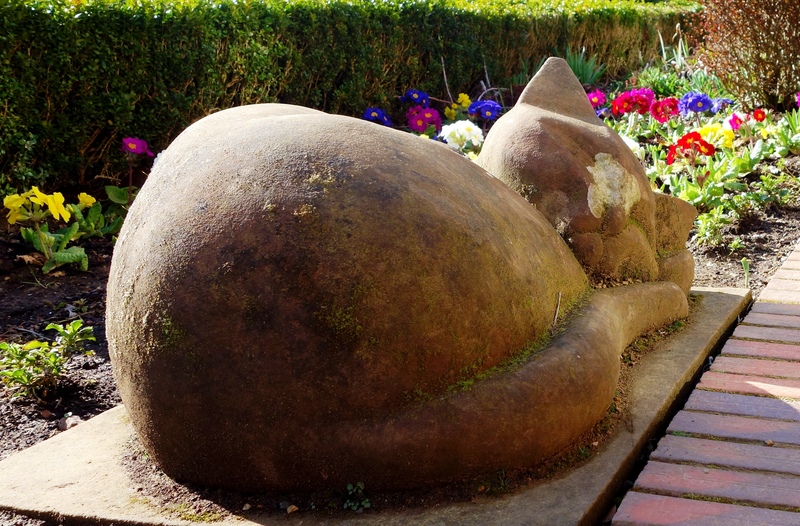 Maybe it should be renamed “Belfast Cats-le” as there are many cats dotted around the grounds. See how many you can find. You can see the lovely outdoor spiral staircase of the building on the second pic here. More cats (I think my focus went off target for the little brass guy oops). And even more cats! 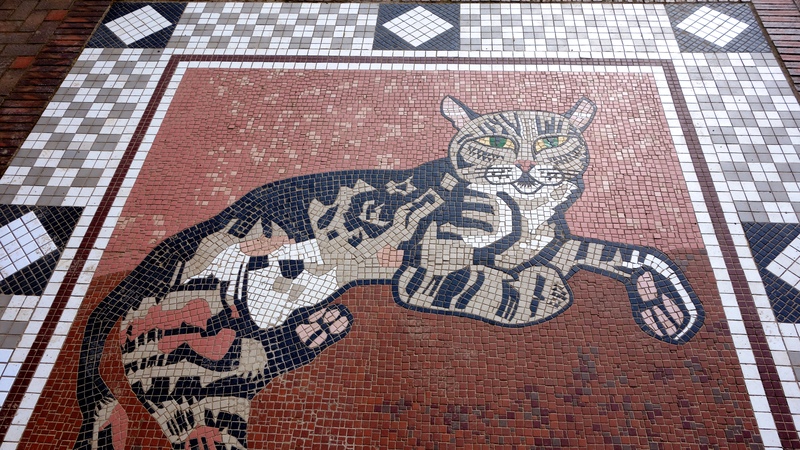 Make sure you look under your feet too as there are mosaic pictures on the floor. 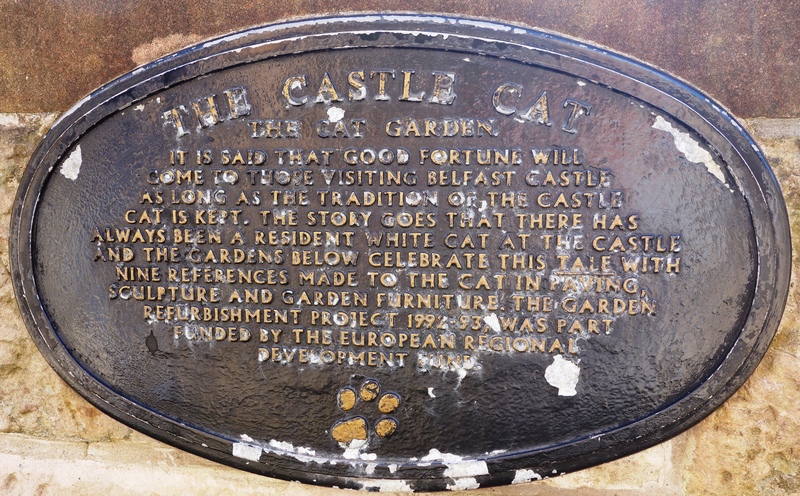 The little cat at the red door has been placed in remembrance for Audrey Beggs “A Cat Lover” and the plaque here tells the tale of the good luck of the white Castle Cat. Miaow!